There are credible indications that a serious review of operations is underway at Amtrak headquarters, being undertaken at the behest of President & CEO Richard Anderson. While the press is not privy to the specifics of the discussions at this point, such radical ideas as splitting long-distance routes into multiple short-distance routes — which the states they serve would then be responsible for funding, under the requirements of the 2008 passenger rail policy law — may be on the table. Passengers wait to board the Coast Starlight at Eugene, Ore. in March 2010. Photo by Bruce Fingerhood / Flickr.com. The passenger carrier’s operating ratio — the portion of operating expenses (excluding capital costs such as infrastructure and fleet renewal) covered by passenger revenues — is hovering around 92%. This seems remarkable by comparison to other passenger rail operators, such as commuter railroads, but the reported number depends on how all the railroad’s overhead and other shared costs are allocated among the various routes. The figure is also bolstered by the company’s aggressive pricing and revenue management tactics. These result in space on trains — particularly on the Northeast Corridor and in sleeping cars — being priced at the very highest point the market will bear. This results in marginal revenue growth while doing nothing to increase the quality or desirability of the product. Lake Shore Limited passengers at Buffalo-Depew station in July 2010. Photo by Z. / Flickr.com. People are willing to take a long train ride, and will pay a premium for it, as long as it’s clean, comfortable and punctual: While the majority of prospective rail passengers may rather fly if the train ride would take more than a certain number of hours, there is still a substantial number who would rather avoid the hassles of flying or the stress of driving to take the train for a long trip. But in order to win and keep such customers, a railroad has to deliver a top-notch product. Amtrak’s long-distance trains too often fall short these days thanks to their ongoing on-time performance woes and the shabbiness of their aging fleet. But these are not reasons to shrink or cut up long-distance routes — doing so would be throwing the baby out with the bathwater. Instead, these are reasons to work together with the host railroads to improve punctuality and to invest in more reliable and attractive equipment. Even with lackluster equipment, frequent tardiness, and sleeping car fares that are often upwards of $250 per night for Roomettes and $500 per night for Bedrooms, sleeper space is still selling well. A one-seat ride is much more attractive than a transfer: Any time a trip from one point to another on public transportation, within or between cities, requires getting off and changing trains or buses, the number of people who are willing to use public transportation for that trip shrinks. People are willing to pay more for a one-seat ride on a single vehicle from origin to destination. Longer-distance trains allow passengers to get more places without having to transfer. The longer the route, the more city pairs are served by one vehicle: The vast majority of long-distance train passengers are not riding a route from end to end; they are going to and from the numerous intermediate stops. With the addition of each new stop to a route, the number of city pair combinations that route makes possible increases exponentially. A long-distance train should be thought of as serving multiple corridors with one vehicle, thus minimizing the net unit costs of equipment and crews by spreading them out over more passenger-miles. Instead of thinking of the Southwest Chief as a Chicago-Los Angeles train, for example, think of it as Chicago-Kansas City, Kansas City-Newton/Wichita, La Junta-Albuquerque and Flagstaff-Los Angeles corridors, and many more, all rolled into one. Long-distance trains maximize network benefits: Going back to the Southwest Chief example, the train doesn’t just serve city pairs between Los Angeles and Chicago. By offering convenient same-day connections at each end, it serves an even greater number of origins and destinations. Kansas City to Detroit or Washington, Flagstaff to Oakland or San Diego, and Albuquerque to Memphis or Cincinnati are just a few examples. Requiring even more transfers for trips like these would greatly reduce their viability. An unidentified passenger in a Superliner coach on an unidentified train in March 2007. Photo by Jon Haynes Photography / Flickr.com. Trains maximize the utility of travelers’ time: A key to what makes train travel more pleasant than the alternatives is that the entirety of a time a traveler spends on board a train is theirs to use as they please. One can get work done, relax, read, listen to music, enjoy the scenery, converse with fellow passengers, eat, drink, sleep and take care of bodily needs all while in motion — not all of which is entirely possible on a plane, in a car or on a bus. Travelers are willing to pay a premium for sleeping car accommodations — thus helping make trips more affordable for coach passengers — in order to maximize these benefits and arrive at their destination relaxed, refreshed and caught up. Without sleeping and dining cars, train travel would be a lot less enjoyable. These services are most viable on long-distance trains. Instead of looking for ways to cut costs in order to make the long-distance trains’ bottom line look better, let’s look for opportunities to grow the network. Given the advantages I’ve just described, adding one or two frequencies on a long-distance route should multiply these benefits. If the disproportionate ridership increases that occurred when frequencies were added on routes like California’s Capitol Corridor and North Carolina’s Piedmont corridor are any indication, the revenue increases that would come from having multiple frequencies on routes like the Crescent and Empire Builder — thus providing more attractive departure and arrival times and schedules that will fit into more travelers’ timeframes — are likely to outpace the added costs. The main obstacle to growing the network, however, is the lack of equipment. Procuring new cars and locomotives — something Amtrak has so far been unwilling to do for the national network trains — will be the most significant share of the added cost of an expansion effort. Given that lead times of at least four years are required for such purchases — from the initial decision to purchase to the final delivery of the last car or locomotive — it’s unclear how much longer we can afford to wait before frequent equipment failures pose an existential threat to the service. And there’s no existing manufacturer with experience in producing both Buy America-compliant rolling stock as well as sleeping, dining and comfortable long-distance coach cars. Even if expanding service does improve the operating ratio, keeping long-distance trains going may still require a modest federal subsidy. This pales in comparison to the many direct and indirect ways in which travelers who drive or fly are subsidized, and is a small price to pay for Americans — especially those who can’t drive or fly for health or other reasons — to have travel choices, and for local and regional economies to reap the ancillary benefits of a robust multi-modal transportation system. Long-distance train riders tend to be stereotyped as wealthy retirees with unlimited time on their hands motivated by a sense of romantic nostalgia — a class of people not worthy of government subsidy. 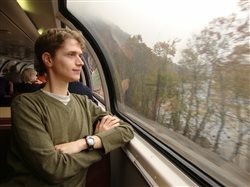 In reality, as I’ve seen again and again when I ride long-distance trains (and I’m by no means a wealthy retiree), the customers of long-distance trains are Americans from all walks of life with a myriad of reasons for choosing the train. Why should our government policy or boardroom decisions made over balance sheets deny them that choice? Luckily, support for the national network trains on Capitol Hill — whether motivated by an understanding or their value or by a simple desire to see one’s state or district included among those served by a federal program — seems to remain high enough to deflect any attempts by Amtrak to make major changes to them. But this political firewall could easily disappear if everyday Americans who value these trains don’t continue to speak up and remind their elected officials of it.